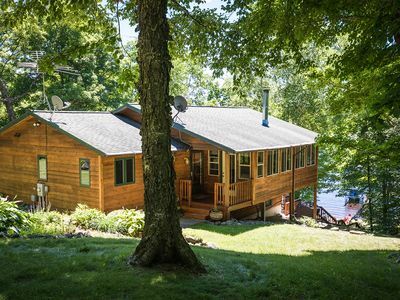 This quality lake home, located nine miles from Hayward, is tastefully decorated with a Northwood's theme and has spectacular lake views. 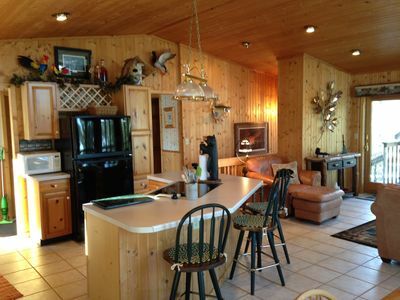 Knotty pine walls and ceilings throughout the interior create a wonderful 'Up North' experience. 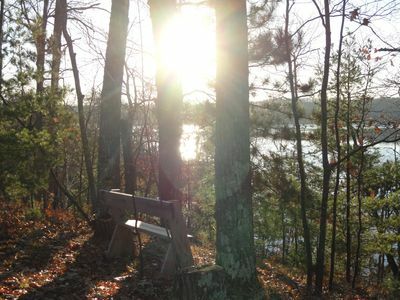 It is an excellent all-season getaway or retreat. 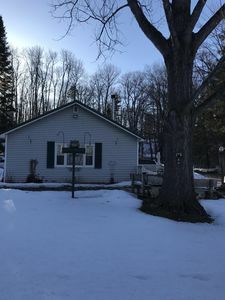 The main level is an open space which includes a kitchen, complete with all cooking utensils, updated appliances, dishwasher, microwave, an island with counter seating for five, a dining area, and great room. 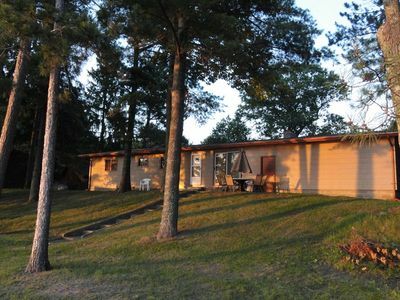 Also on the main level are two bedrooms and a full bath. 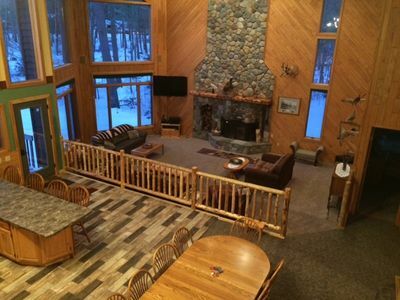 It all opens up to large chalet windows with great panoramic lake views. 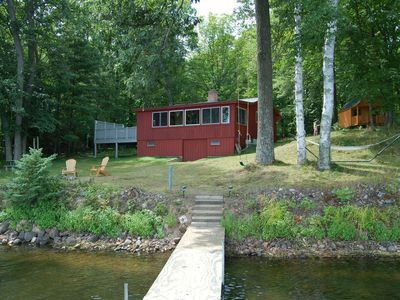 A large deck complete with a gas grill overlooks the lake and dock area. An attached 10x10 screened porch is furnished with adirondack chairs creating a relaxing area to enjoy. 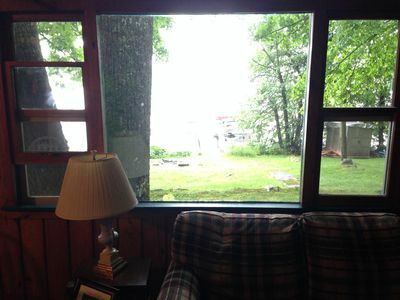 The lower level family room is a walkout with a lake view. 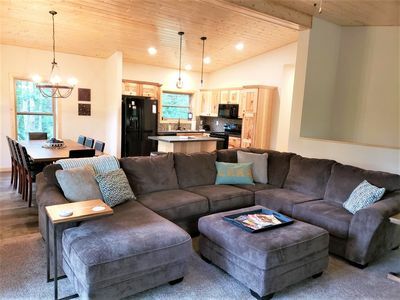 The lower level family room has two double futons and a single chair/sleeper, a woodburning stove, flat screenTV/DVD player, bar/sink area, and a small refrigerator. 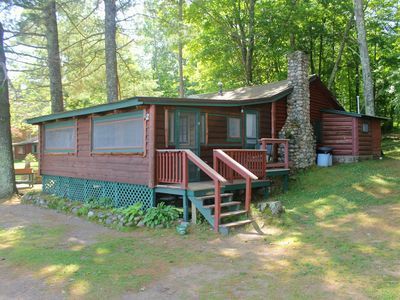 The lower-level also includes a third bedroom furnished with a full log bed and a log bunk bed, a second full bath and a laundry room with a full-size washer and dryer. A pack and play and high chair are available. Walk out the lower level to a large cement patio, swing and a fire pit stocked with ample firewood. 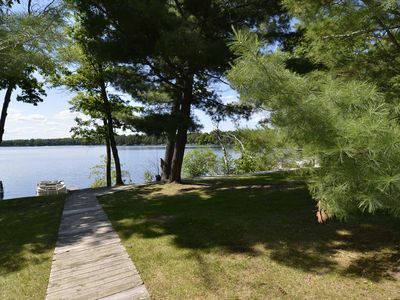 Gradual steps to the lake from the patio is a private dock and a sandy-bottomed swimming area. 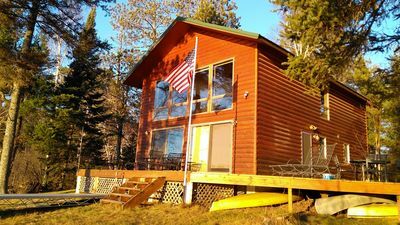 This cabin is located on Placid Lake with boat access to Burns, Tiger Cat, McClaine, Upper and Lower Twin Lakes. 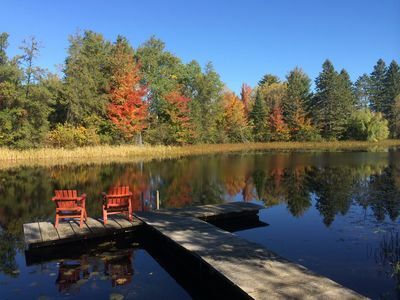 Lake Placid is a 162 acre lake located in Sawyer County. 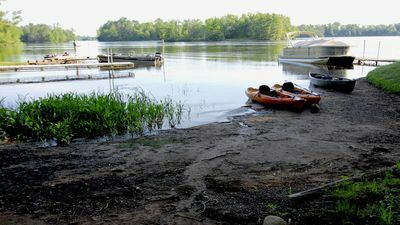 Fish include Musky, Panfish, Largemouth Bass, Northern and Walleye. The lake's water is moderately clear. 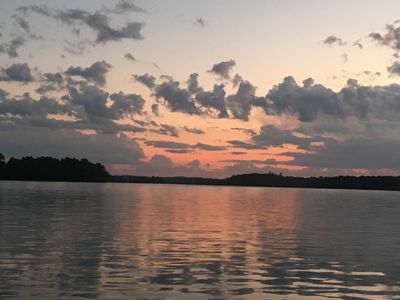 Whether you have a pontoon, fishing boat, ski boat, canoe or kayak, all can be used to navigate these waters as you enjoy the natural beauty of the land and wildlie. 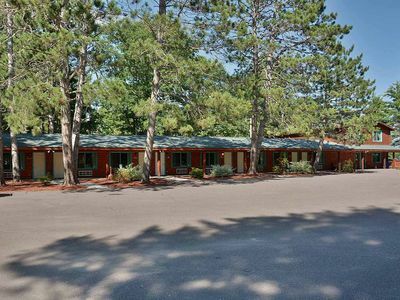 You will be conveniently located just minutes from several golf courses, a casino, restaurants, attractions, area events, and festivals. 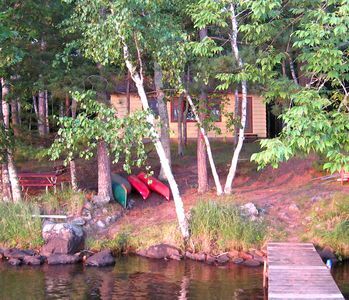 The cabin is a recreational paradise with many lakes nearby and snowmobile, ATV, hiking, cross-country skiing, and biking trails. Bird-watching can often be combined with a leisurely paddle on the lake. Experienced fishing guides are also available. It is a Harley Davidson rider's destination and makes a great base camp for all the great riding in the area. 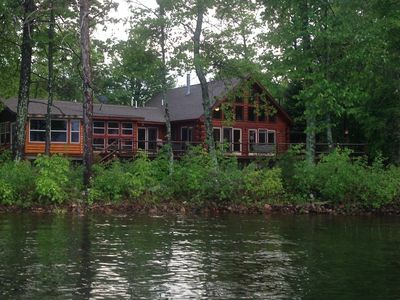 The cabin is located 3 hours by car from Minneapolis/St.Paul and 7 hours from Chicago. For more information. NOTE: THIS HOME IS LICENSED AND INSPECTED BY THE STATE FOR RENTAL USE. 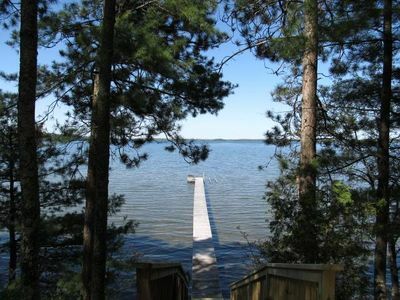 Michele's on the Bay -Executive Home on Hayward Clear Lake! 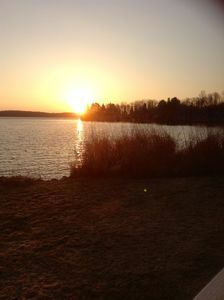 Stay on the BEST snowmobiling lake in Wisconsin!